The Secretary for Labour and Welfare, Mr Stephen Sui, met with the Minister for EU Affairs and Trade of Sweden, Ms Ann Linde, at Central Government Offices, Tamar, today (June 28) to announce the establishment of a bilateral Working Holiday Scheme between Hong Kong and Sweden. Photo shows Mr Sui (right) and Ms Linde at the agreement signing ceremony. The Secretary for Labour and Welfare, Mr Stephen Sui (second right), met with the Minister for EU Affairs and Trade of Sweden, Ms Ann Linde (second left), at the Central Government Offices, Tamar, today (June 28) to announce the establishment of a bilateral Working Holiday Scheme between Hong Kong and Sweden. Also attending the agreement signing ceremony were the Commissioner for Labour, Mr Carlson Chan (first right); and the Acting Consul General of Sweden in Hong Kong, Mr Stefan Noreén (first left). 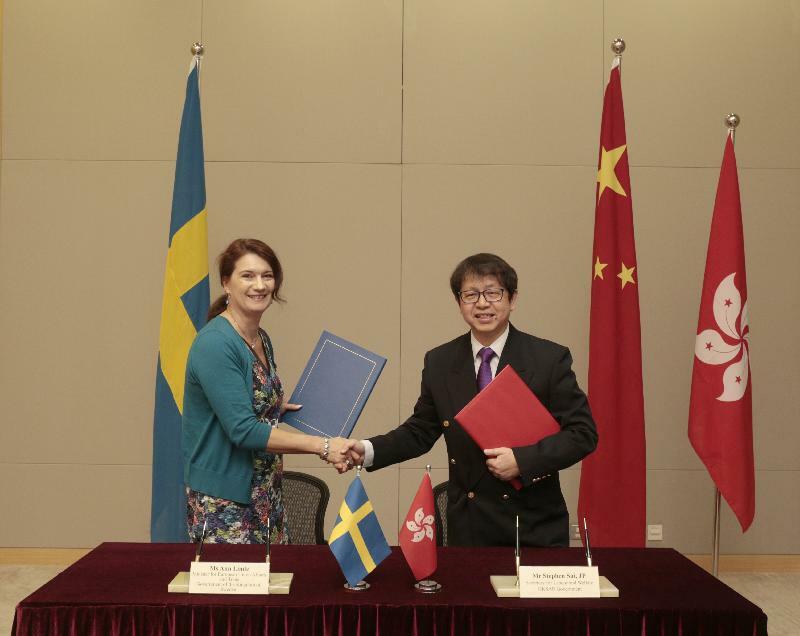 Hong Kong and Sweden today (June 28) signed an agreement to mark the establishment of a bilateral Working Holiday Scheme for young people of the two places. The scheme will commence operation on January 1, 2018. 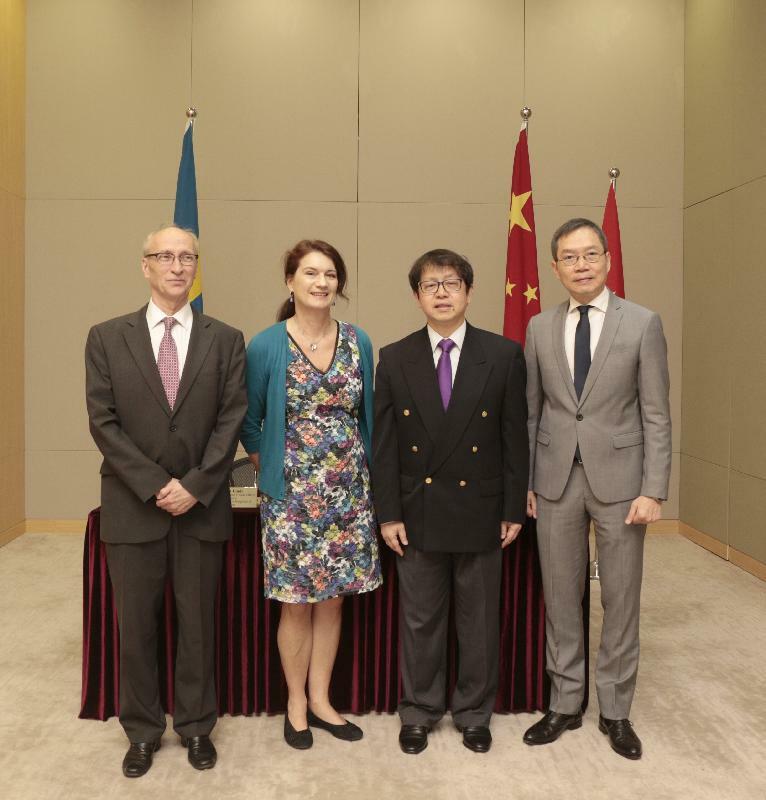 The agreement was signed by the Secretary for Labour and Welfare, Mr Stephen Sui, and the Minister for EU Affairs and Trade of Sweden, Ms Ann Linde, at the Central Government Offices, Tamar. Welcoming the establishment of the scheme with Sweden, Mr Sui said, "This scheme provides an opportunity for young people in Hong Kong and Sweden to broaden their horizons and to gain living and working experience in a foreign culture. It will also further reinforce bilateral ties between Hong Kong and Sweden." The scheme with Sweden is Hong Kong's 12th bilateral working holiday scheme. Since 2001, Hong Kong has established working holiday schemes with New Zealand, Australia, Ireland, Germany, Japan, Canada, Korea, France, the United Kingdom, Austria and Hungary. So far, more than 78 000 Hong Kong youths have benefited from the schemes. When the scheme commences operation on January 1, 2018, youths from each side will be able to apply for a visa under the Scheme, which will allow them to stay in Sweden or Hong Kong for up to 12 months. During the period, they may work to finance their stay. There will be an annual quota of 500 from each side. Details of visa application procedures for applicants from Hong Kong can be found on the website of the Consulate General of Sweden in Hong Kong at www.swedenabroad.com/en-GB/Embassies/Hong-Kong. Applicants from Sweden may contact the Hong Kong Immigration Department by telephone on 2824 6111 or obtain the necessary information from the Department's website www.immd.gov.hk.